Think you don’t screw up? Sure. But if you think the giants of science don’t make dumb, obvious, or catastrophic blunders, at least in public, think again. 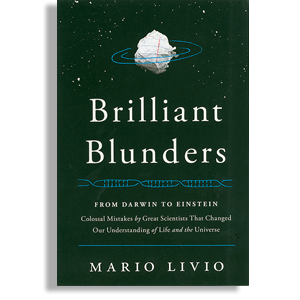 Still, in a book that removes the blinders on blunders by five brand-name scientists, you might expect the author to cut those smarty-pants down to size. But author Mario Livio, an astrophysicist, is not interested in dancing on the graves of the great. Instead, he delivers a crash course in evolution and physics as he seeks lessons from “colossal mistakes”: Why did they happen? Who had the story right? And what was learned as the blunder was revealed? * Charles Darwin: The patron saint of evolution failed to recognize that a detail of his theory would “dissolve” changes through the generations — and thus stymie the gradual change at the heart of evolution. * Lord Kelvin: A giant of thermodynamics, namesake of the Kelvin thermal scale, botched the scientific analysis of the age of the Earth: a number with fundamental ramifications in astronomy, biology and geology. * Linus Pauling: He literally wrote the book on physical chemistry, but was so overeager to pin down the structure of DNA that he offered a proposal that was chemically unworkable. * Fred Hoyle: The astrophysical genius who figured out how heavy elements were formed during star explosions argued to his death that the universe was in “steady state,” long after Edwin Hubble discovered that it was expanding. * Albert Einstein: Around 1917, the archetype of the brainy nerd added the “cosmological constant” to his relativity formula, to explain why the universe was neither expanding nor collapsing due to gravity. After Hubble’s revelation, Einstein withdrew the constant as an unnecessary blight on the simple beauty of his equations. Then in 1998, evidence began accumulating that, far from being restrained by gravity, the universe is actually expanding faster – resurrecting the cosmological constant to explain the behavior of matter on the largest scale. Although the arguments in this delightful book grow intricate, it’s salted with thought-provoking questions. If, for example, the universe is constantly expanding and changing, how do we know physical laws are immutable?